On October 24, 2010 at 13:56 Engine 38 and Rescue 392 were dispatched to the area underneath of the George Redding Bridge for a fall victim. Upon arrival firefighters found that a male subject had fallen approximately 10-15' down a concrete embankment under the bridge. The patient was found unconscious/unresponsive with head injuries. Firefighters had to contend with steep terrain while packaging the patient. A medevac helicopter was requested to fly to Maxwell Field for an LZ. WFD and WPD members assisted in carrying the victim out from the area on the rough terrain. AtlantiCare Paramedics arrived on scene. The patient was transported to the LZ and transferred to the flight crew of Medevac 5. Units operated for approximately for just over an hour. The patient was reported to be in critical condition. 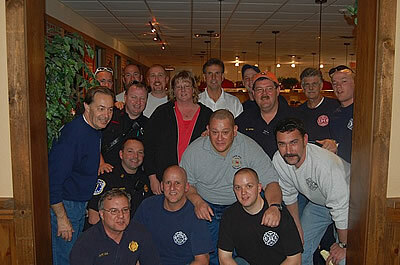 at Pizza Hut in Wildwood Thursday Night, April 30. 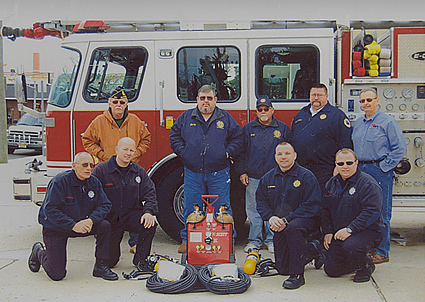 The Wildwood American Legion Post #184 recently donated confined space rescue equipment to the City of Wildwood and the Wildwood Fire Department. To date the post has donated over $50,000 of specialized rescue equipment, including the Jaws of Life and airbag and rope rescue equipment. From left, standing: American Legion Members Jack Casey, Harry Tweed and Greg Mazzota, Wildwood Fire Chief Conrad Johnson, Jr., and Mike Haggerty of MES AllSafe Fire Equipment. Kneeling, from left: Firefighters Ben Ingersoll, Jim Grauel, Captain Dan Speigel, and Gerald Vessels. Firefighters from Wildwood, North Wildwood and West Wildwood participated in the annual NJ Special Olympics Polar Plunge in Wildwood. 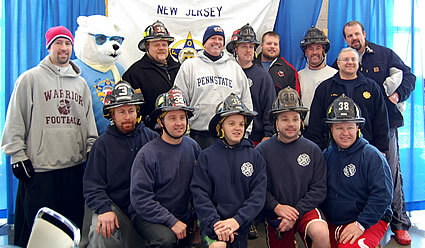 Above, the firefighters pose with Philadelphia Eagles Hank Fraley and Jon Runyan.